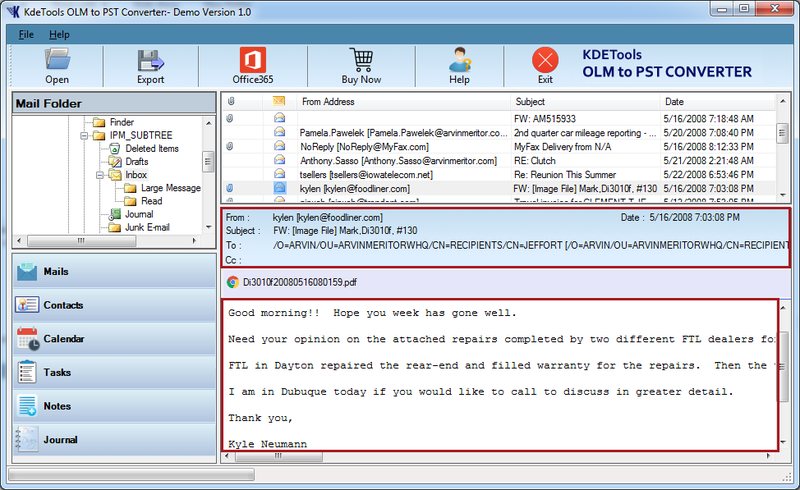 OLM to PST converter is able to export all OLM emails, note, contacts etc. to Outlook PST format. Split OLM file option is available. 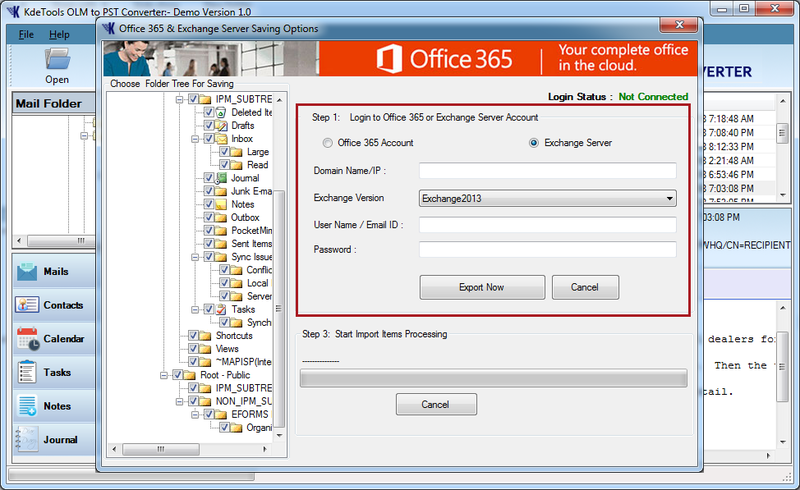 User can export OLM to office 365 and live exchange server. Export OLM to various file types such as PST, MBOX, EML, EMLX, MSG, HTML, and PDF. 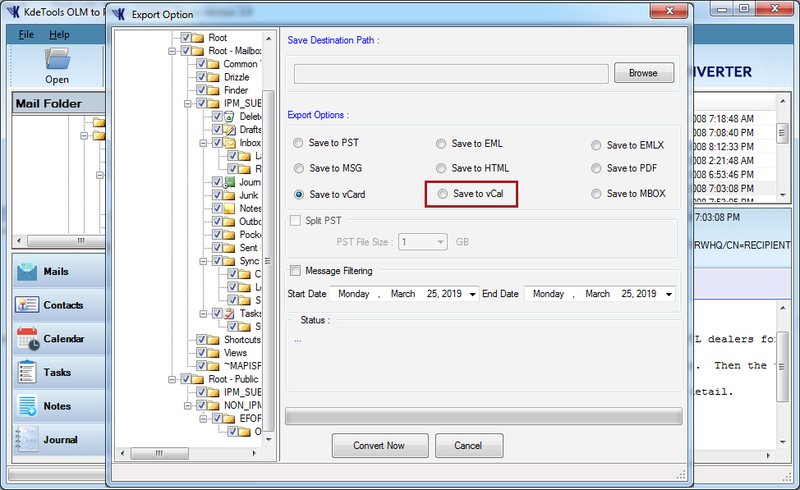 Migrate OLM Contacts and Calendar to vCard and vCal file respectively. Tool Maintain meta property of email messages of OLM files. Export OLM emails with attachments like Audio, Video, PDF, PPT, Excel, Word, etc. Software does not change folder structure of OLM file. There is no file size limitation while converting the file format. Convert OLM to PST between specific dates. Get Mac OLM file converted into PST file type for Windows Outlook. This software provies options by which you can easily manage converted file. Split, Message filtering, Selective conversion, etc are some extra added benefits of the tool. Split PST by Size with available option. 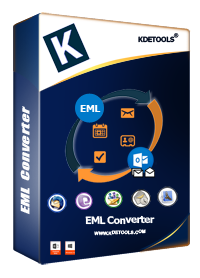 OLM to PST Converter allow users to convert Mac OLM file to PST and other file types such as MBOX, EML, EMLX, MSG, HTML, PDF, vCard (Contacts), and vCal (Calendar) file type. It remains all Meta properties as it is as before. 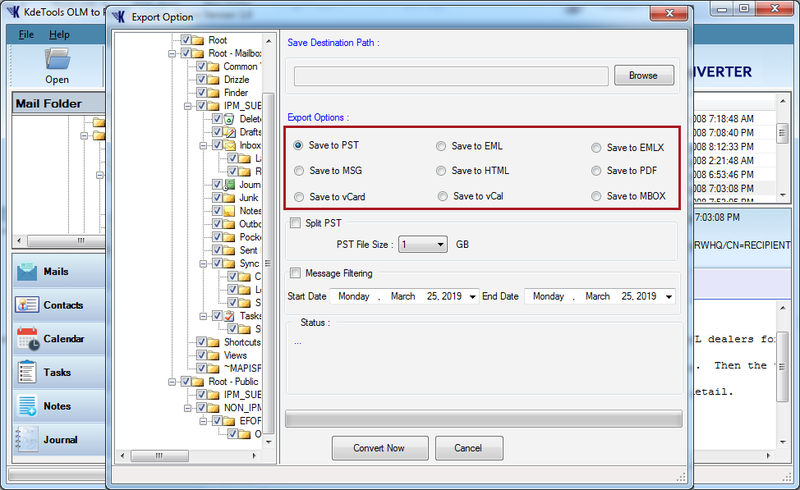 Message Filtering option is available for all file types. Import Outlook Mac data file (.olm) to Office 365 directly with the software. It also provides you Message filtering option to import data from a specific date range. You just need to enter Office 365 credentials and click to import. Software is secured with SSL for data security. 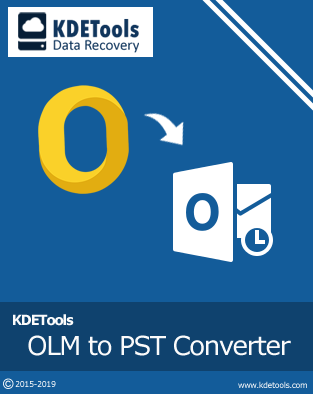 Import Mac Outlook data file (.olm) to Live Exchange Server directly by using OLM to PST converter. 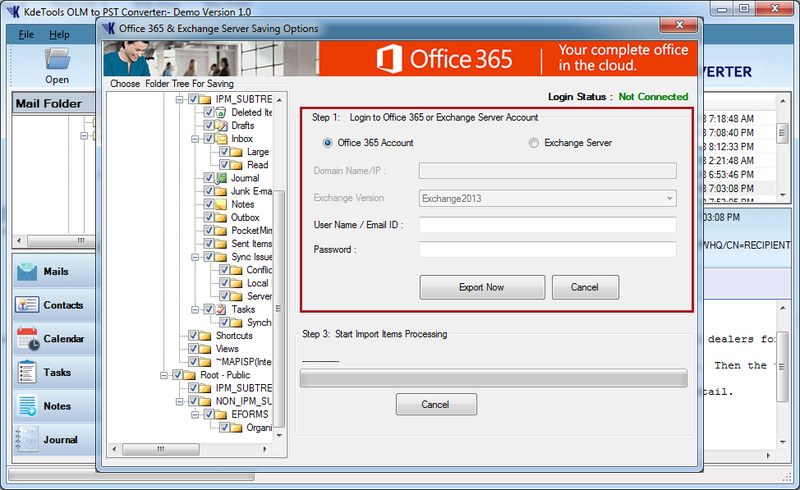 Enter credentials, choose requred message filtering option, and import to new profile of Exchange Server. It supports all versions of Exchange Server. Convert OLM to PST file with attachments, exact HTML formatting, embedded images, links, etc. Also, it keeps original Metadata (to, cc, bcc, sent/receive date & time, etc) as it is as before. Files & folder structure will be also maintained by software. Export OLM contacts to vCard file type in just few clicks. vCard is globally accepted file format for contacts by which you can easily access OLM contacts in any platform or device. Export multiple contacts in single vCard file. Export OLM Calendar to vCal file type by which you can easily access OLM calendar in ical supported platform. Events and all calendar properties will not be changed during conversion process. Calendar properties/ events will not be altered. Software enables you to open and view OLM file contents without any cost. It shows complete preview with embedded items and Metadata info. You can also export first 30 items from each folder of OLM file. Complete Preview of OLM File Contents. 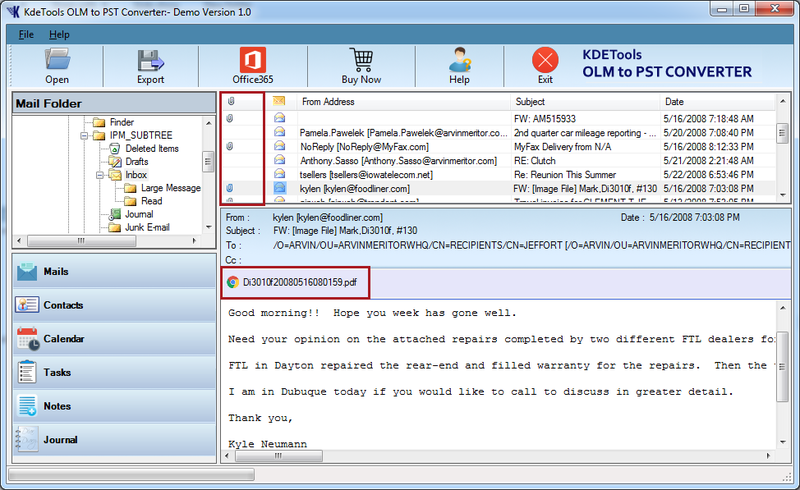 *Free download enables you to check OLM file contents and save initial 30 messages.